Click on the links to read an excerpt of each novel. Powerful corporate executive. That was Dave Locke. His entire sense of self and success rested on that identity, but when he loses his job, he is forced to figure out who he really is. After taking a new job, he comes to realize that he is a lot more than a corporate executive. He is disturbed by the greed, selfishness, and materialism of his colleagues and clients and decides to make some changes. As a veteran of office intrigues and boardroom wars, he knows how the game is played and works his way to the top of his new firm and tries to make business about more than growth and profit. His new approach puts him on an entertaining collision course with egotistical executives, cutthroat lawyers, and Ivy League MBAs, and he find out that challenging the capitalist system can be a frustrating and risky business. 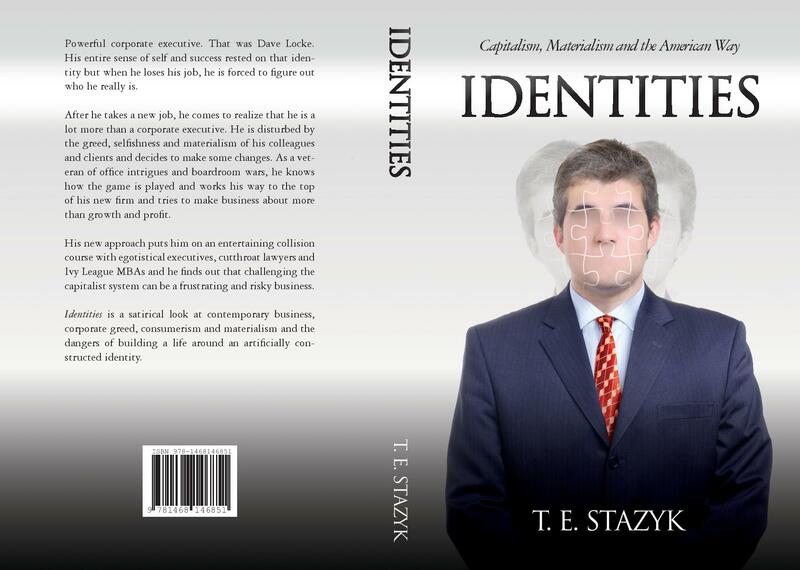 Identities is a satirical look at contemporary business, corporate greed, consumerism, materialism, and the dangers of building a life around an artificially constructed identity. Jack Finney, a partner with Larkin & Shaw, a major accounting firm, is on trial for violations of securities laws in connection with the bankruptcy of Suteba Corporation. As he awaits the verdict of the trial, he reflects on his career and what went wrong. As Jack looks back, he realizes that his hunger for material success and recognition had blinded him to the ethical and moral implications of his actions. Aliens mistake fifteen year old Tyler Fielding for their long lost god. He and his mother Christine decide to take the job. Read an excerpt. I have managed to loan a primeval model of Kindle from a friend but I can’t seem to land on amazon’s e-book. It only shows paperback under formats. Does buying a Nook or Kobo version get you a pdf that can be read on a Kindle? It that doesn’t work, or isn’t responsive to your issue, let me know. Thanks for your interest and I hope you enjoy the book! That is truly bizarre. When I go to that page I get a little box near the bottom of the page (no need to scroll down) that says “Formats” You can then click paperback or kindle. If you hover on the kindle it opens a little box and you can click on that as well and it takes me to the sign on page. I’m in Asia Pacific too and don’t get that warning. What can I say? Technology. Smashwords is the “renderer” who takes your e-manuscript and crunches it into all the different formats required by the various e-book publishers. You can buy all the different formats from them and also preview before you buy–scroll down to the bottom of the page and see which one makes sense for you. Hope that works! Let me know and sorry for the hassles. I always thought you were in England–where are you? Got it, changing the region to India does it! Ah, yes. I have a love/hate relationship with Mumbai. Based on the reviews, you are probably right about Dork. But I picked it up and had never read anything similar and I enjoyed the sarcasm.